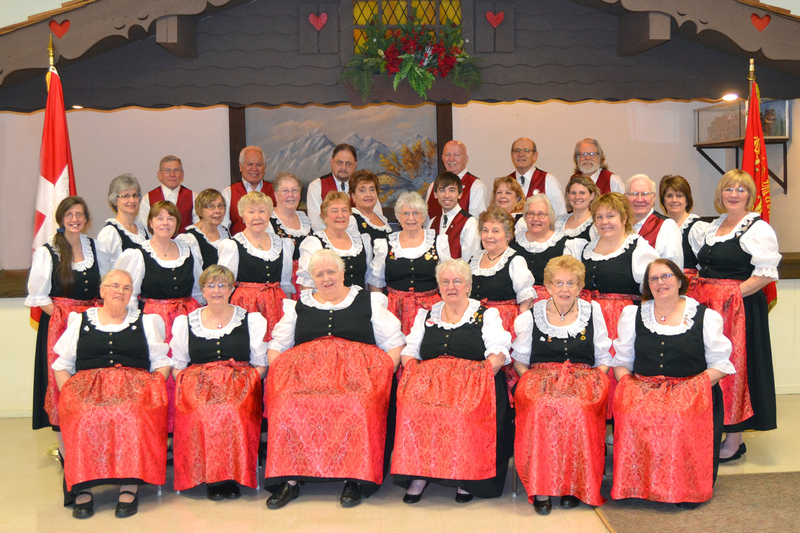 The Toledo Swiss Singers, one of the area’s oldest singing groups, will be asking the question, “WHO DUNNIT?” at their fifth annual dinner-theatre mystery event, held for two nights, Feb. 23 and 24. 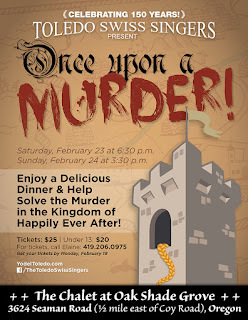 The evening, titled “Once upon a Murder!,” will feature a murder in the Kingdom of Happily Ever After — at The Chalet at Oak Shade Grove, 3624 Seaman Road in Oregon. Enter the mythical world of classic fairy tale characters. Members of the audience will enjoy watching the drama unfold, along with some great musical performances. During the evening, there will be a mysterious cold-blooded killer on the loose. Who is the victim? When does it happen? Which character is responsible? 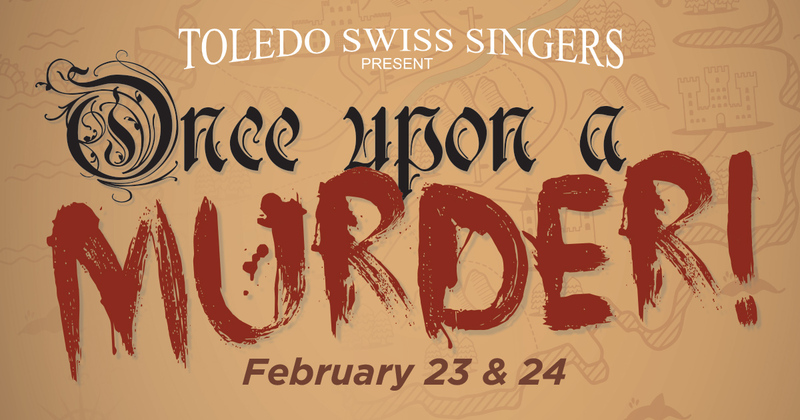 Written and directed by Swiss Singer Jane Williams, “Once upon a Murder!” will have audience members using evidence provided and making keen observations to carefully conduct their own investigations. Gather the clues and determine who could be the killer! The evening will include a delicious menu: roast beef au jus, twice-baked potato casserole, mixed vegetables, salad, rolls, desserts, a cash bar and, of course, the murder mystery. 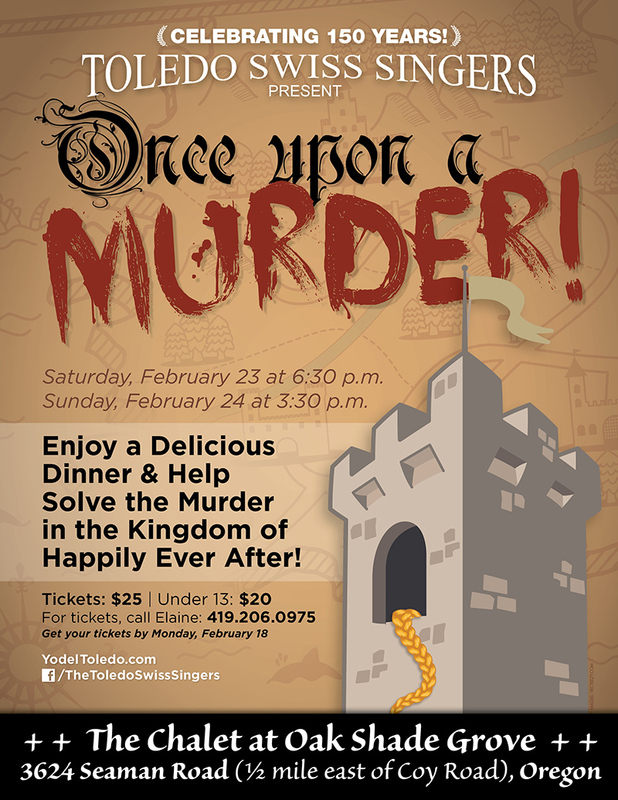 The theatre presentation begins promptly at 6:30 p.m. on Saturday, Feb. 23, and 3:30 p.m. on Sunday, Feb. 24. Dinner will be served during the performance. 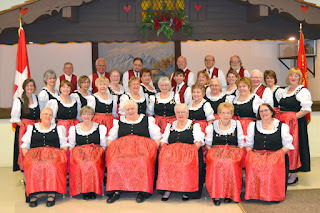 Tickets are $25.00, with $20.00 tickets for children 13 and under. Reserve seats by Feb. 18 by calling Elaine at (419) 206-0975.